A Honda Australia's corporate stand showcasing automotive, motorcycles, advanced four-stroke power equipment and marine products has been well received at rural field days throughout the country this year. Following success of the integrated stand at last year's Ag-Quip Field Day, the global company is once more taking the opportunity to highlight the synergy between product categories and promote these benefits to customers throughout Australia. Attracting plenty of attention at the recent Toowoomba Farmfest Field Day, Honda Power Equipment Manager, Ray Briffa, said that the integrated product platform demonstrates Honda's strong brand commitment at a grass roots level. "The Honda brand is synonymous with reliability, innovation and cutting-edge technology; these qualities are made possible through an inclusive and cooperative approach between all our product lines," he said. "The decision to host an integrated corporate stand is testimony to Honda's commitment to the application of research and development across all departments for the betterment of all product categories. 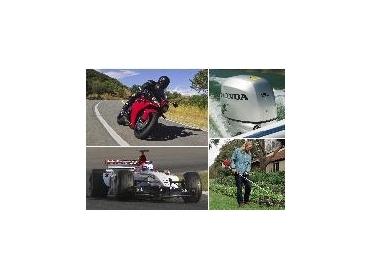 "The engineering know-how behind some of Honda's finest cars and motorcycles has been applied to the design of many of the company's advanced-four stroke power products. "Hosting corporate stands at Field Days across the country is an excellent opportunity for us to showcase the high quality products the company has to offer; we have had a very positive response following Farm World, Ag-Fest and Farmfest this year, and are looking forward to this trend continuing into the future," he said. Honda's corporate stand will be on display at the upcoming AgQuip Field Day in Gunnedah, NSW 19-21 August.